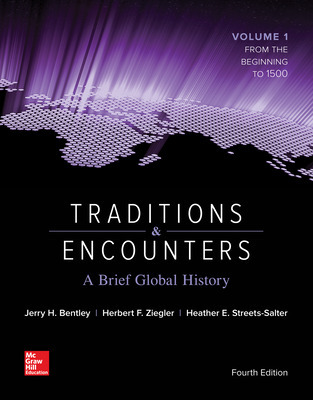 Based on Bentley and Ziegler's best-selling, comprehensive survey program, Traditions & Encounters: A Brief Global History provides a streamlined account of the cultures and interactions that have shaped world history. A focus on the human experience helps frame the broad scope of world history into a clear and concise learning experience for students. Bentley’s engaging narrative is available as a digital SmartBook™, a personalized eBook that enhances understanding by asking students to demonstrate comprehension as they read. It is also supported by engaging digital tools, such as interactive maps, that encourage critical thinking and retention of key course concepts. SmartBook is sold separately and does not come automatically with the purchase of the textbook. PART I THE EARLY COMPLEX SOCIETIES, 3500 TO 500 B.C.E. PART II THE FORMATION OF CLASSICAL SOCIETIES, 500 B.C.E. TO 500 C.E. 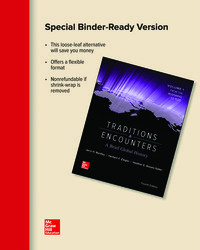 PART III THE POSTCLASSICAL ERA, 500 TO 1000 C.E. PART IV AN AGE OF CROSS-CULTURAL INTERACTION, 1000 TO 1500 C.E.